Not everyone is into seafood, much less shrimp, but my husband is crazy about them. If I have shrimp on hand, he will steam and snack on them like potato chips.. which gets annoying if I planned on using them for a recipe. But I beat him to the punch today when I made this dish. A few readers commented how much they like Ina Garten's Roasted Shrimp & Orzo recipe. I took a look at it and it's a pretty easy, straightforward orzo salad with a hint of Mediterranean flavors. With no orzo in the pantry, I substituted it with Israeli couscous. I actually prefer this type of couscous over the traditional one. Why? Israeli couscous has a much better, fail proof consistency in my opinion, since the traditional kind can get too mushy if you're not careful. To add a bit more color, I added chopped tomatoes as well. Be sure to allow the flavors to meld - I recommend preparing this salad a day in advance and serving it at room temperature, not chilled. Lastly, to avoid the shrimp from overcooking and getting rubbery, I reduced the roasting temperature to 350 degrees. Prepare the Israeli couscous as directed, but substitute the water called for in the directions with chicken broth to add flavor. Once cooked, place in a large bowl. Whisk together the lemon juice, 1/2 cup olive oil, 2 teaspoons salt and 1 teaspoon of pepper. Pour over the couscous and stir well. 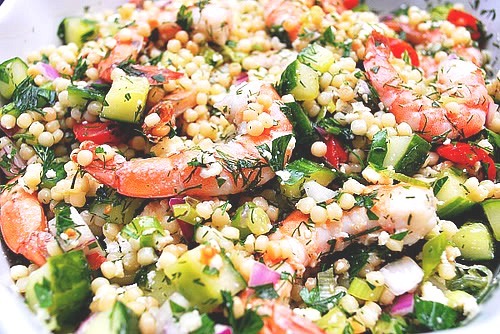 Add the shrimp to the couscous and add the scallions, dill, parsley, cucumber, onion, tomatoes, 2 teaspoons salt, and 1 teaspoon pepper. Toss well. Add the feta and stir carefully. Set aside at room temperature for 1 hour to allow the flavors to blend, or refrigerate overnight. If refrigerated, taste again for seasonings and bring back to room temperature before serving. I love shrimp. But talk about an expensive snacking habit! Yum!! That looks so good and I feel like I have almost all of the ingredients on hand - woo! Gorgeous colors in this dish! Looks wonderful! This looks so beautiful, colorful and fresh! A great meal for lunch or dinner! This looks delicious, and so colorful! This is one of Ina's recipes I have been wanting to try. Haha, I'm like your husband. I will eat shrimp wherever and whenever I can :) Great recipe. Has anyone tried to serve this as a hot entree? Looks like it would be delicious. Sounds good but where does the 1/2 cup lemon juice come in?